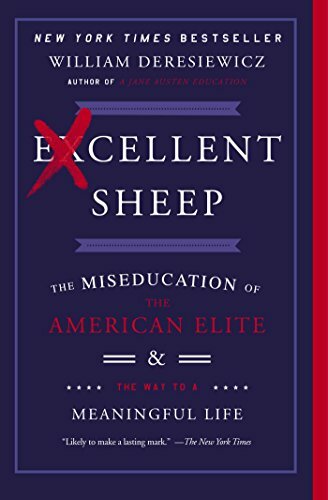 There is not a book for 20-somethings quite like Excellent Sheep: The Miseducation of the American Elite, by William Deresiewicz. No book more clearly articulates what coming of age is like, and why it's so hard. To any parents who are struggling to understand their 20-somethings: this is the book for you. For any college student or college grad who is struggling, this book is also for you. Deresiewicz puts everything in context: while college is now the ubiquitous path out of childhood for most Americans -- and the one longed for by many who are unable to attend -- it is not a system divined by God, nor one that makes a great deal of sense for most young people to enter adulthood. College is a system that has evolved in very recent history, and not towards particularly positive ends. Deresiewicz provides the history of this evolution and what it means for students, and families. For one, children are now raised towards the ends of succeeding in school and going to a good college, not necessarily with any clear sense of the ultimate goal -- Happiness? Joy? Financial success? In a book that I have underlined almost endlessly, I have a hard time knowing where to begin in sharing its message. Simply: read this book. I cannot emphasize enough how spot-on Deresiewicz is; he nails the critique of the modern American education system and the way the system effects the psychology of all of us. For anyone confused about why they're so miserable in college or out of college, this is your Bible.